Three women vacationing in the Cayman Islands look terrified as the stingray photobombs them, with a little help from the gentleman behind them. They are swimming in an area known as Stingray City, where swimmers feed the rays with squid. 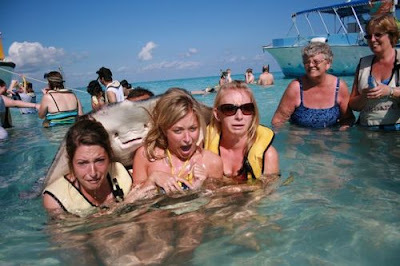 And where rays terrorize unsuspecting women guests. The photo, not surprisingly, has gone viral.